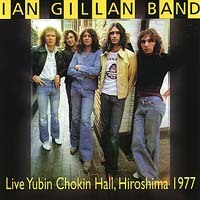 In 1977 Ian Gillan and his Band touched down in Japan for a six-date tour, one gig is preserved on this CD. Newly remastered by band member Ray Fenwick, the 16-page booklet features rare and previously unseen photos from his personal archive. This classic concert includes the first-ever release of ‘Trying To Get To You’ as well as the rock ‘n’ roll medley. This will be a must-have for all Gillan fans but of wider interest to those who appreciate the excitement of a live classic rock performance. The Ian Gillan Band features Ray Fenwick (guitar), John Gustafson (bass). Mark Nauseef (drums) and Colin Towns (keyboards). This CD is the perfect complement to the Angel Air releases SJPCD007 (The Rockfield Mixes) and SJPCD017 (Live At he Rainbow). ...the dullness of tone and some inevitable tape hiss won't detract from the infectious enthusiasm of the band, which features the dexterity of luminaries such as Mark Nauseef and John Gustafson. ...Metalheads unite!...The band was touring to promote the recently released Scarabus album but of course the set list meanders across Gillan's repertoire, not only including a heavy-duty 'Woman From Tokyo' and a spookily rearranged 'Child In Time', but also a rock 'n' roll medley at least as powerful as that which Purple themselves used to play as their encore...The post-bootleg sound quality is a bit of a letdown...The performance itself, however, more than makes up for such deficiencies, while the booklet offers up 16 pages of priceless reminiscences, information and statistics. The recording is a bit rough and ready but it's the atmosphere that makes it great...It's all very seventies and lasts over an hour. Collectable.